The present century is characterized by unprecedented challenges and opportunities, arising from globalization, the desire for inclusive development and the imperatives of climate change. Globally it is being recognized now that integrating social, environmental and ethical responsibilities into the governance of businesses ensures long term success, competitiveness and sustainability. This approach also reaffirms the view that businesses are an integral part of society, and have a critical and active role to play in the sustenance and improvement of healthy ecosystems, in fostering social inclusiveness and equity, and in upholding the essentials of ethical practices and good governance. This also makes business sense as companies with effective corporate social responsibility (CSR), have image of socially responsible companies, achieve sustainable growth in their operations in the long run and their products and services are preferred by the customers. The idea of CSR first came up in 1953 when it became an academic topic in HR Bowen’s ‘Social Responsibilities of the Business’. The term “corporate social responsibility” became popular in the 1960s and has remained a term use since then. Although the idea of CSR has been around for more than half a century, still there is no single universally accepted definition of CSR. All the definitions which are prevalent these days underpin the impact that businesses have on society at large and the expectations of the society on them. Various definitions which are prevalent today are given below. The European Commission (EC) has previously defined CSR as ‘a concept whereby companies integrate social and environmental concerns in their business operations and in their interaction with their stakeholders on a voluntary basis’. In October 2011 the EC published a new policy on corporate social responsibility. The Commission defines corporate social responsibility as ‘the responsibility of enterprises for their impacts on society’. To fully meet their social responsibility, enterprises ‘should have in place a process to integrate social, environmental, ethical human rights and consumer concerns into their business operations and core strategy in close collaboration with their stakeholders’. United Nations Industrial Development Organization (UNIDO) defines CSR as ‘Corporate social responsibility is a management concept whereby companies integrate social and environmental concerns in their business operations and interactions with their stakeholders. CSR is generally understood as being the way through which a company achieves a balance of economic, environmental and social imperatives (Triple-Bottom-Line Approach), while at the same time addressing the expectations of shareholders and stakeholders. In this sense it is important to draw a distinction between CSR, which can be a strategic business management concept, and charity, sponsorships or philanthropy. Even though the latter can also make a valuable contribution to poverty reduction, will directly enhance the reputation of a company and strengthen its brand, the concept of CSR clearly goes beyond that’. The definition of CSR as per World Business Council for Sustainable Development (WBCSD) is ‘The continuing commitment by business to contribute to economic development while improving the quality of life of the workforce and their families as well as of the community and society at large’. The definition of CSR from the World Bank Group is ‘Corporate social responsibility is the commitment of businesses to contribute to sustainable economic development by working with employees, their families, the local community and society at large, to improve their lives in ways that are good for business and for development’. From the definitions of CSR, the following can be inferred. The CSR approach is holistic and integrated with the core business strategy for addressing social and environmental impacts of businesses. CSR needs to address the well being of all stakeholders and not just the company’s shareholders. Philanthropic activities are only a part of CSR, which otherwise constitutes a much larger set of activities entailing strategic business benefits. CSR is a management concept and a form of corporate self regulation integrated into a business model. By CSR organizations integrate social and environmental concerns in their business operations. CSR policy functions as a built-in, self-regulating mechanism whereby a business monitors and ensures its active compliance with the spirit of the law, ethical standards, and different norms. In some models, an organization’s implementation of CSR goes beyond compliance and engages in ‘actions that appear to further some social good, beyond the interests of the organization and that which is required by law’. CSR is a process with the aim to embrace responsibility for the organization’s actions and to encourage a positive impact through its activities on the environment, consumers, employees, communities, stake holders and all other members of the public sphere who may also be considered as stakeholders. CSR is generally understood as being the way through which a company achieves a balance of economic, environmental and social imperatives (Triple Bottom Line approach), while at the same time addressing the expectations of shareholders and stakeholders. In this sense it is important to draw a distinction between CSR, which can be a strategic business management concept, and charity, sponsorships or philanthropy. Even though the latter can also make a valuable contribution to poverty reduction, will directly enhance the reputation of an organization and strengthen its brand, the concept of CSR clearly goes beyond that. The concept of CSR encompasses today all related concepts such as triple bottom line, corporate citizenship, philanthropy, shared value, corporate sustainability and business responsibility. Key CSR issues are environmental management, eco-efficiency, responsible sourcing, stakeholder engagement, labour standards and working conditions, employee and community relations, social equity, gender balance, human rights, good governance, and anti-corruption measures. 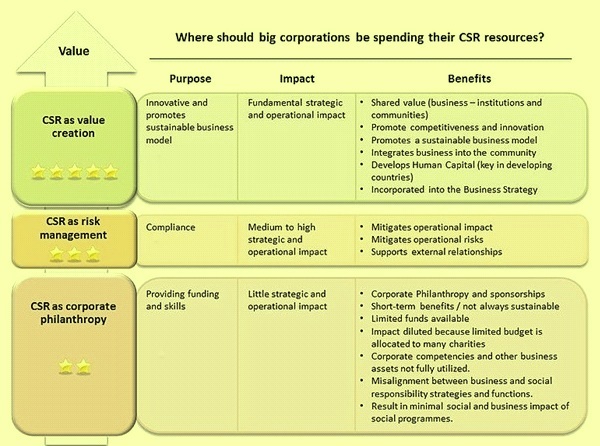 The CSR activities of an organization should normally cover the following core elements. Care for all stakeholders – The organization should respect the interests of, and be responsive towards all shareholders, employees, customers, suppliers, project affected people, and society at large etc. The organization should create value for all of them. Ethical functioning – The governance system of the organization should be underpinned by ethics, transparency, and accountability. The organization should not engage in business practices that are abusive, unfair, corrupt, or anti-competitive. Respect for employee’s rights and welfare – The organization should provide its employees a working environment which upholds the dignity of the employees. It should maintain equality of opportunities without any discrimination for its employees. Respect for human rights – The organization should respect human rights for all and avoid complicity with human rights abuses by the organization or by the third party. Respect for environment – The organization should take measures to check and prevent pollution, recycle, manage and reduce waste, should manage natural resources in a sustainable manner and ensure optimal use of resources like land and water, should proactively respond to the challenges of climate change by adopting cleaner production methods, promoting efficient use of energy and environmental friendly technologies. Activities for social and inclusive development – The organization should undertake activities for economic and social development of communities and geographical areas, particularly in the vicinity of its operations. CSR and sustainability reporting – Reporting and disclosure of all CSR and sustainability activities transparently and accountability gain and reinforce the thrust of the stakeholders. A strategic approach to CSR is important to the competitiveness of the organization. It brings benefits in terms of risk management, cost savings, access to capital, customer relationships, human resource management, and innovation capacity. Since CSR needs engagement with internal and external stakeholders, it enables the organization to better anticipate and take advantage of fast changing societal expectations and operating conditions. Hence CSR drives the development of new markets and create opportunities for growth. With CSR the organization address to its social responsibility and through it, the organization builds long term employee, customer and citizen trust as a basis for sustainable business model. Higher levels of trust in turn create an environment in which the organization can innovate and grow. A properly implemented CSR policy in an organization can bring along a variety of competitive advantages, such as enhanced access to capital and markets, increased sales and profits, operational cost savings, improved productivity and quality, efficient human resource base, improved brand image and reputation, enhanced customer loyalty, better decision making and risk management processes. Fig 1 Typical approach for CSR for large organizations.